Holiday parties are a popular way for companies of all sizes to celebrate their employees in a festive way. 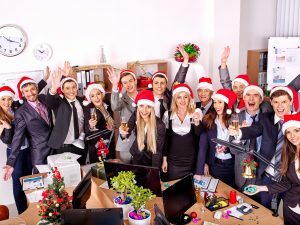 Research has shown that when done properly, company holiday parties can cultivate employee engagement, making workers feel more appreciated by their employer, giving them something fun and cheerful to look forward to and allowing them to interact with their colleagues in a more relaxed way. Holiday parties are a great way to thank employees for a great year, but if not planned carefully they can turn into an HR nightmare.. Most people have a story or have heard stories of an employee who maybe had a little too much to drink at the holiday party and did something that would be considered wildly inappropriate for the workplace. Even if the company party is held offsite, certain behaviors can still create HR issues that can quickly escalate into legal trouble for the employer. In order to avoid the legal disaster that a holiday party can turn into, employers need to ensure they include their HR professional in their party planning, and provide some basic rules for employees to follow while in attendance. Below are some simple suggestions for employers to help ensure their next holiday party doesn’t end up being an HR nightmare. Don’t make it mandatory. For any non-work-related company event that occurs outside of normal work hours, attendance should be optional. Requiring employees to attend holiday parties that occur outside of normal work hours can create legal issues, especially for workers that are not exempt under the Fair Labor Standards Act (FLSA). If non-exempt employees are required to attend the holiday party, they may not only be entitled to their regular pay, attendance may trigger overtime pay as well. Employers should consider including a note in their holiday party invitations to let employees know that attendance is optional, so there’s no confusion. Have a clear goal. Yes, even the holiday party should have some kind of clear goal or purpose. If the goal is team-building, there should be some kind of organized activity to get the employees working together and having fun. If employee appreciation is the goal, some kind of speech or award presentation should be included in the event. Not having a goal or any kind of schedule planned for the party can give employees too much room to make their own fun - which could end up going in a bad direction. Be careful when serving alcohol. One of the biggest liabilities at any holiday party is the provision of alcohol to guests. Serving alcohol without liquor liability coverage open the party host up to some legal trouble. For example, if an employee leaves the party after drinking too much, gets into an accident and injures someone, the employer could be liable. An open bar can also give some employees the “liquid courage” to behave inappropriately and create harassment issues, too. Employers may want to consider limiting alcohol consumption through the use of drink tickets, or just skipping alcohol entirely. Holiday parties are a great way to spread cheer throughout your organization and celebrate the end of another year. Knowing the liabilities before planning your company holiday party is a great way to keep both your employees and your business safer this holiday season.